The Irish came into the area at the very beginning of the 1800’s. 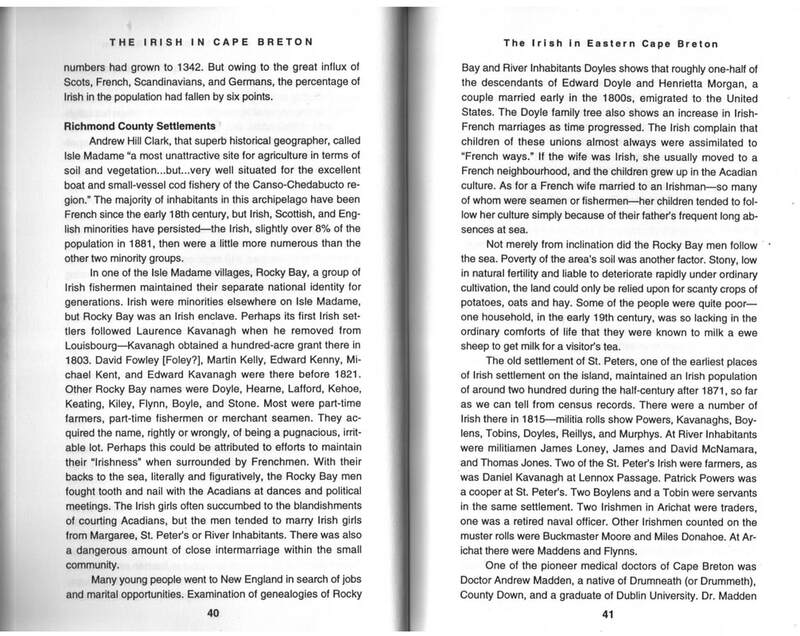 These were the refugees from the Wexford Uprising (rebellion) of 1798 who, in hiding from the British authorities, settled well back in the woods bordering on the Inhabitants Basin, until it was safe to move nearer the shore of the Basin. These refugees, most of whom settled in Rocky Bay, Richmond County, and the Margarees in Inverness County, had reason to be fearful under the Penal Laws. Not only were their lives to be extinguished as traitors for daring to fight against the British crown, if they were unfortunate enough to be discovered by the authorities, but, according to British Penal Laws, it was illegal for them to be in British North America. These refugees were represented by the families of Doyle, Cloak, Dunphy, Hayes, Lamey, Morgan, possibly Scanlan (formerly Scantling), possibly Tyrrell (formerly Farrell), Welsh and White. Only the family names of Doyle, Hayes, Morgan, Scanlan, and White families can still be found in the Basin - River Inhabitants communities today, though the genes of the others flow in the veins of both these, as well as in the veins of the Loyalist descents, of some of the Scottish descents, and of some of Acadian descent. The Cloaks and the Welsh’s moved away from the area, with the remaining old people dying out. The Tyrrells and the Dunphys moved to the Isle Madame area during the early 1900’s. Some of the Irish of Whiteside had a connection with President John Fitzgerald Kennedy’s mother, Rose Kennedy. She was born of a Wexford Uprising refugee family, the Fitzgerald family, and was actually a cousin to the Basin Road, Whiteside, Doyles* and Morgan families. Both families were descendant relatives of Lord Edward Fitzgerald, one of the most important leaders of the 1798 Wexford Uprising. The Morgans and Doyles were descendants on their mother’s side, Mary Fitzgerald, while Rose was a descendent on her father’s side. It wasn’t only because he participated in the uprising, that Mary’s son, Edward John Morgan Sr., spent the remainder of his life as a refugee hiding deep in the woods of Basin Inhabitants on a hundred acres. As close relative of Lord Fitzgerald, Edward Morgan, he believed that the Amnesty of 1803 did not apply to him, and that the British would hang, draw and quarter him, if he were to be caught. Indeed, back in Ireland all the Morgans left in Limerick had been vengefully exterminated by the English forces after the put-down of the uprising. Long after the Amnesty and their father’s and grandfather’s death, his children, grandchildren and great-grandchildren kept the secret. The history of Ireland has Edward John killed at the Battle of Vinegar Hill, outside Wexford Town. If they ever knew, Ireland’s historians seem unaware that such a large number of 1798 Wexford Uprising refugees had escape to the new world, many with the help of the people from Scotland. *It is through intermarriage with the Morgans that the Doyles can also claim descent from Lord Fitzgerald. The most common Irish name, McNamara, to be found in the communities of the The Basin and River Inhabitants, is not one of the refugee families but are descendants of a David McNamara, who arrived in Guysborough County from Boston around 1784 - 1790, the same time as did the Loyalists, and married a Sarah Hall at Halifax,. McNamara settled, with the permission of the then General, on Boucher Island in the Basin Inhabitants. After two attempts, first as an Irishman and secondly, five years later, as a Scotsman, he was granted the island which was renamed McNamara Island. There the McNamara first multiplied and flourished, until the island could no longer support their numbers. 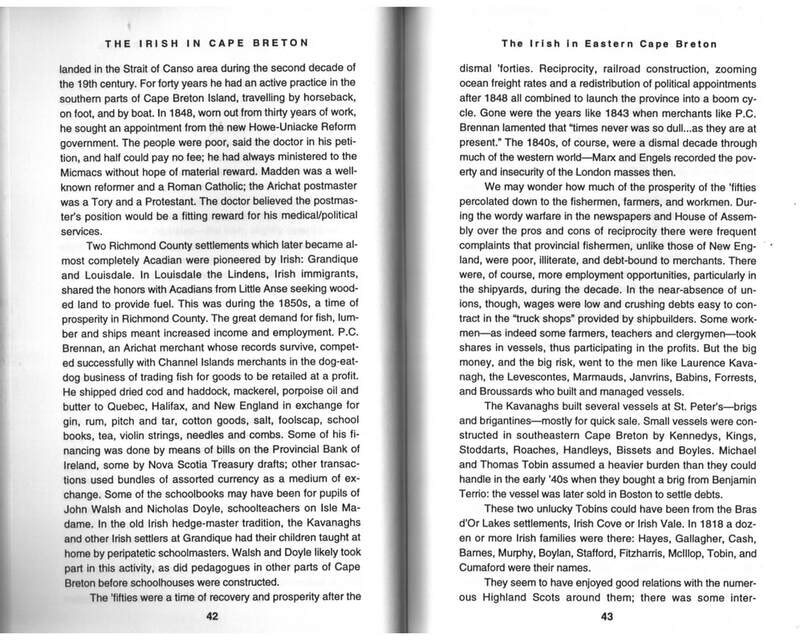 Many of them then moved over to Evanston and Lower River Inhabitants, though a number of them moved to the United States, looking for employment. The notable Senator Robert McNamara, of the United States Senate, proudly claimed his ancestral roots in Lower River Inhabitants, Nova Scotia. McNamara Island no longer has full time residents. excerpted from Lester Morgan, "A Brief History of River Inhabitants," revised 2017. Angus A. MacKenzie. 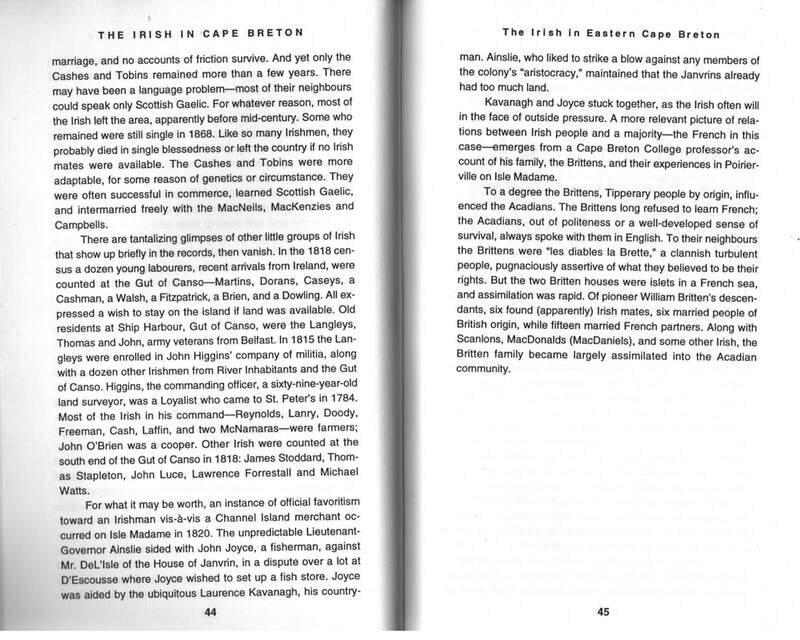 The Irish in Cape Breton (Wreck Cove, NS: Breton Books) 1999, pp.40 ff.